IDBI Executive previous Papers are available here. The interested applicants can download here for free in pdf format. The contenders who are attending the IDBI Bank exam can download the IDBI Bank Executive Question Papers for preparation purpose. Here, in this article, you can also check the exam pattern and syllabus for the IDBI Executive exam. Are you searching for IDBI Executive question papers? Then stop your browsing and download the IDBI Executive question papers in this article for free of cost. The applied candidates who are in search of the exam pattern and syllabus can find in the below sections. By practicing the previous question papers of IDBI Bank Executive, the aspirants will get an idea of how the questions will be asked in the exam. The candidates who want to achieve their career growth in the bank field can use this chance. Every year IDBI bank releases a vast number of vacancies for the eligible candidates. The interested candidates must be serious about their preparation for the Executive post in IDBI Bank. Moreover, we have provided latest IDBI Bank Executive model questions papers along with the solutions for the sake of aspirants. The IDBI Bank Executive exam contains multiple choice questions. The total number of questions is 200. The total number of marks for all subjects is 200. The duration of the exam is 90 minutes. There is a negative marking of 0.25 marks for each wrong answer. The applicants should go through the selection process before starting exam preparation. Check the selection criteria and get prepared yourself for the IDBI Executive exam. The selection process for the IDBI bank is of two rounds. Written Test and the personal interview. The selected candidates in the written test will be called for interview. Check the IDBI Bank Executive syllabus provided here. The applicants can prepare for the IDBI Bank Executive exam according to subjects listed below. The aspirants who are interested in attending the IDBI Bank executive exam should download the IDBI Bank Executive solved question papers for adequate preparation. The IDBI Bank executive papers may be useful for the candidates to get a good score in the exam. By exercising the sample question papers of IDBI Executive, the aspirants will get a scope on all the subjects that deal with the IDBI Executive exam.The Practice Question Papers of IDBI Executive evaluates the performance of the candidates. Before going to practice the previous question papers of IDBI, it is better to follow the syllabus and exam pattern. We hope that the above-provided IDBI Executive previous papers will be very useful for the aspirants to prepare better for the exam. 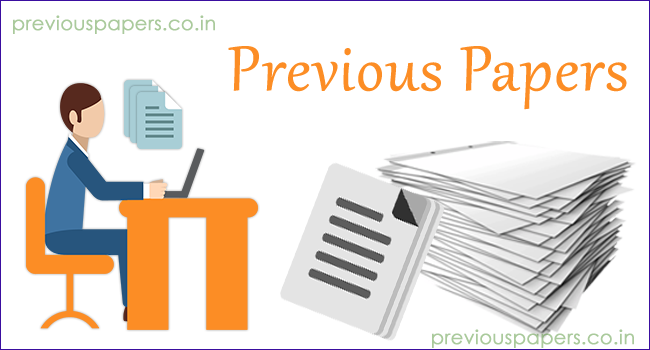 You can also visit the official website www.previouspapers.co.in www.previouspapers.co.in for the latest information on the state and central government jobs.